Ever wondered how long you can save your seeds and have them still be viable? We've created this chart to help you determine the longevity of your seeds. I have talked about container gardening a few times in the past few months. At the moment I have plants growing both in the ground and in containers. I noticed recently that I have less of a pest problem in containers than in-ground. Finally catching up on the blog – its been a crazy last few weeks literally glued to our computer screens. But we’re making progress! Last night there was a potluck for Baltimore-area women farmers. The meet-up was really inspiring, a little bit nerve-wracking, but definitely the thing I needed to snap me out of this winter hibernation mode I've been feeling lately. A beautiful photo of garlic from Farm Aid staffer, Jennifer! North Country Sustainability Center, Inc. just agreed to lease a retired elementary school in Ashburnham, MA as our temporary home base. This will allow us to start offering programs, make local food and art pieces available for sale, and build the long term goal of creating a very exciting project. After 8 weeks away, there's a lot to catch up on here. It makes me so happy to see the energy and activity here - and the HOMEGROWN Fair submissions are such a wonderful testament to how powerful skills and skill-sharing can be. We sell pumpkins along the roadside. Just a few cornstalks standing, a Fall sunset colors the sky. It was another wonderful week of HOMEGROWN Fair submissions. They've been fantastic so far - it's hard to pick just one winner each week! We love taking a peek into the backyards, gardens, and kitchens of HOMEGROWNers; thanks for sharing. I'm in love with sunchokes. 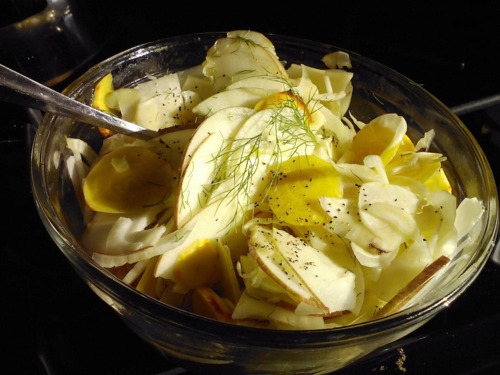 I just came up with a recipe for a side dish that pairs their whispered nutty flavor with the licorice nip of fennel, and the smack of apple. I'm thinking I'll remake this for a unique Thanksgiving side.